Suso Cecchi d’Amico is probably one of the greatest screenwriters you (the American) have never heard of. It's the 1940s and post-WW2 Italy was ravaged economically, it was also recovering from a brutal and oppressive fascist regimen authored by Dictator Benito Mussolini. So the intellectual atmosphere took on political undertones, but most importantly for film, neorealism (neorealist). 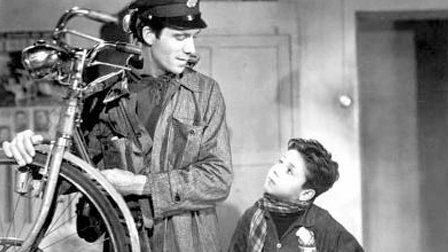 This was perhaps best expressed by the movie THE BICYCLE THIEVES (released in the U.S. as THE BICYCLE THIEF), directed by Vittorio De Sica and co-written by Suso Cecchi d’Amico and others including Cesare Zavattini. With regard to modern times and American cinema, I will point out how the recent film NEBRASKA has interesting similarities to this Italian film. With his son Bruno, Antonio (played by a non-professional actor) must recover the bicycle before Monday or he'll lose his job. The story is filmed on the streets of the city and according to an interview in the magazine Cineaste, they at times adapted the story according to what they found in and around Rome. And as noted, they often used regular people from the streets. This is part of the reason for the birth of the neorealist film which screenwriter Cecchi d’Amico gets a lot of deserved credit for; but it wasn't all her work obviously. The other writers and especially the director Vittorio De Sica, created such a masterpiece. The father and son fail to find their bicycle and this leads to Antonio making the difficult choice to try and steal one of his own. His attempt fails and he is captured. The men who catch him see his son weeping and realize the family's desperation, and they allow him to go. The movie ends with the two walking away into the abyss of the streets of Rome. Of note, the touching scene is made more so by Bruno taking his father’s hand and leading him away. The themes of family, struggle, and those hard choices that must be made create a gritty and realist story of post war Italy. As for screenwriters there are lessons abound here in the simplistic, yet tight and focused narrative. The central character of the story has a clear goal: find his bicycle. There are obstacles that ultimately prove to be too great. This causes him to make a desperate decision (late in the third act, by the way). One he doesn’t want to make, but he must. The ending is nihilistic with his failure to get a bicycle, but that is part of the neorealism. If you think about this story and NEBRASKA there are a lot of similarities that struck me right away as I read Bob Nelson’s award winning screenplay recently. 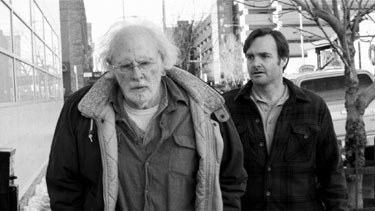 In NEBRASKA you have a desperate father who wants to leave something behind for his sons – he has failed his family much like Antonio; though for different reasons. He sets off on a singular mission: get his million dollars (and his stolen air compressor!) Just like Antonio, his son joins the journey with him. They face obstacles, have to walk the streets of small town America, and ultimately they fail to get the million dollars; which we knew would happen. (And if you think about it, we knew that the bicycle would never be recovered in BICYCLE THIEF.) Ending wise NEBRASKA is obviously not as nihilistic, but it is still as poignant and dramatic as THE BICYCLE THIEF. So at its core NEBRASKA offers a very real and at times depressing view of rural America. But it offers more optimism and hope, which is very American. In the follow-up to this, I’ll offer a more detailed breakdown of the two screenplays along with analysis. Of note, Suso Cecchi d’Amico wrote or co-wrote many award winning films and worked on over a 100 screenplays making her easily one of the most prolific writers of cinema.